When GM7 and GM8 came along, there seemed to be a lack of interest in these things, mainly due to the poor performance in real world situations of any lighting engines, and no engine created for those versions seemed to equal the previous ones. However, with the introduction of shaders to GameMaker: Studio, it appeared that the lighting bug had bitten again and I wanted to see just how these new systems compare to those I tested long ago. The first of these assets that I tested was TrueLight 2D, by xygthop3. The reason I chose this one to start with was that in my game I figured that I'd only really be needing shadows for the walls and doors, so since it is advertised as working with tiles, I figured that this could be a fast and easy way to add some nice ambient lighting effects to my game without increasing the instance count. Sadly, I was wrong... Yes, the engine is fantastic at what it does - and I can't recommend it enough for easy lighting, especially in platform games - but due to the way I was creating my game and the different tile depths required to give that "pseudo" 2.5 D look, it just wasn't working out as I'd hoped. 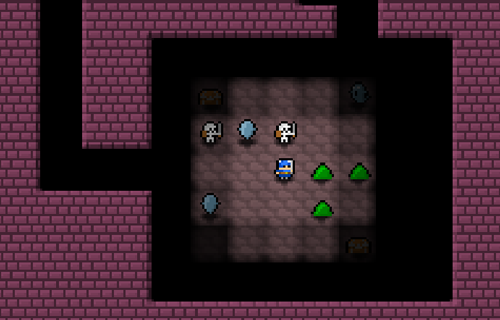 I also found that after adding multiple lights to my game (quite a few actually! ), the FPS was quite drastically reduced, and the number of vertex batches being sent to the GPU was rather high, meaning that for a mobile game I'd potentially have problems. The Glare Engine by Tizzio was the next asset I tested, and if I am honest I should say that I was blown away by it. Honestly, the first impression when testing the demo was "Wow! ", as it really is one of the most complete lighting engines I have seen for GameMaker, and although it has it's complexities, actually setting it up and getting the basics running seemed like a pretty easy thing to do. So, I set to work adding the engine to my core game. However, as you can probably see in that GIF, I was also having problems... particularly with having the light surface syncing with the movement of the view. No matter what I did I could not get it to update in time, and there was always an annoying lag. I also felt that the engine itself was actually overkill for my game, as it has a huge number of scripts and components, and I really did only want a simple light/shadow engine. I don't need bloom, nor do I need day/night cycles, nor do I need any of the other bells and whistles that make this such an amazing asset! Which got me thinking about just what I did need, and whether or not I should maybe just forget about other people's assets and make something for myself. Going back to basics, I started thinking about what I really wanted from lighting in my game. Did I want it to reveal things as the player progresses or did I just want it as an effect to enhance the user immersion? Or both? 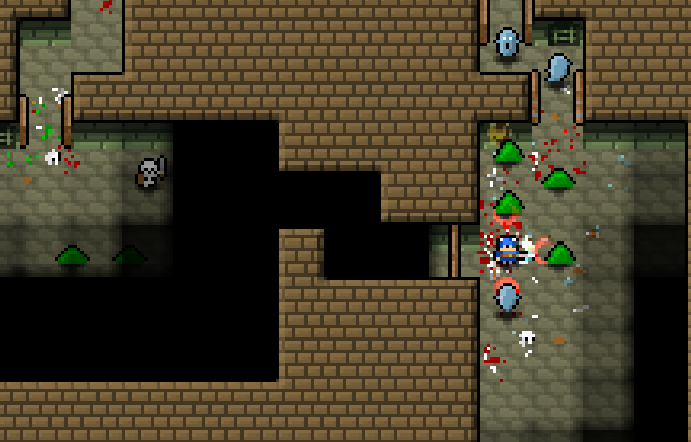 Since this was going to be a rogue-like action game, I decided that having everything dark and letting the player explore and discover things would be good, and maybe add a touch of suspense as you open a door and suddenly discover 100 enemies behind it. I also thought about the structure of my game, and how it's grid-based, which led me to conclude that I should make a "block" lighting system. I set about doing this using tiles again. Since the room is on an 8x8 grid, I started by simply tiling the whole room from top to bottom with 8x8 black tiles. The tile ID for each was stored in another ds grid, and then I wrote a script that would modify the alpha of the tiles around any given point. this was actually quite efficient, as I didn't have to loop through the whole grid to change the alpha, but rather use the radius of the light source to only check the corresponding grid area around it. This was looking quite nice, but I still had to deal with collisions, so that the light doesn't go through the walls or doors. the obvious solution was to use a collision line, then quantise the results into the grid, but, as we all know, the collision functions are a bit slow and it would waste any optimisations I have made by using tiles. Cue a quick search of Google which threw up a nice formula called Bresenham's line algorithm. Basically, this takes a straight line and then rasters it down to a grid, and after checking some of the JS and C++ code examples that I found, it was pretty easy to add it into GameMaker as a script and make my own collision line function from it for grids (you can find it here, if you're interested: GMLScripts.com). Now I had the effect that I wanted! Taking inspiration from the older ligthing engines, I set about writing my own in a similar style to them. I wasn't going to use shaders as I don't know enough about writing them, but I do know surfaces, and all the best engines previously used them to create their magic. With the changes to how GameMaker: Studio renders things, and the fact that I didn't need anything too complex, I figured that I could whip up something workable that would both do what I wanted and also be light on processing. As you can see from the illustration - which I have exaggerated a bit - the actual shadow can be an odd shape due to the projection method and the different angles involved (and, in fact, the engine will also render any type of polygon with a shadow, not just blocks, including convex or concave, which gives even weirder shadow shapes), and if I don't project the points from the corners far enough then users will see the edges. The other issue with this way of doing things is the sheer processing required to do this every step. However I came up with a solution to that too! What I did was have every light source create a surface, then draw itself to that surface, before finally looping through the shadow caster objects and drawing them on top. This meant that the final projection points didn't matter as long as they were outside the bounds of the surface, and with everything held on a single surface, I could then use a controller variable and only update the contents when necessary. 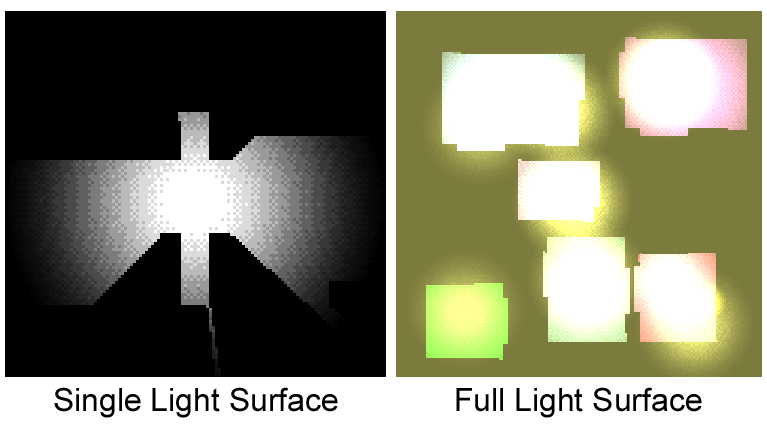 Essentially, I was converting all lights from dynamic (updated in real time) to static (updated once then simply drawn). This would give a massive frame boost and, since it's actually controlled by a single variable, I could also turn these static lights to dynamic lights if I wanted to (and back again). Think about this. I have a room with a light and a number of doors. As long as the doors are there, then the shadows that those lights cast won't change (since the walls don't move). So they are kept static. However when the player opens a door, the update variable is set and the surface is re-drawn, only now without the door shadow caster, and then the update variable is set to false again. Now, the FPS is still kept high even with a lot of lights in the room, and the "hit" when a light is updated is minimal because it only happens every now and then! These individual light surfaces are then drawn to the final "full" light surface, which is then overlayed on the screen. Note that in most engines they use an additive blend mode, but for mine I decided to use a "multiply" blend mode, as I feel it gives a far more natural look to the lights. And that was my lighting engine created! I was getting a much better frame rate than with any of the shader options, it looked nicer than the FOW/tile based solution, and it was just flexible enough to be used for other things and not just my own game (in fact, as with other things I've made, it's <a href="https://marketplace.yoyogames.com/assets/721/aura-surface-based-lighting" target="blank">available on the Markietplace too!). The only down-side to it was that I was still getting a pretty huge number of vertex batches, but on Mobile it was running smoothly and still had frame rate overhead to spare, so I wasn't too worried about that yet.